Interview with Pedro Gomes, who is Software Engineer at the University of Madeira and one of the makers of the WalkMe App. 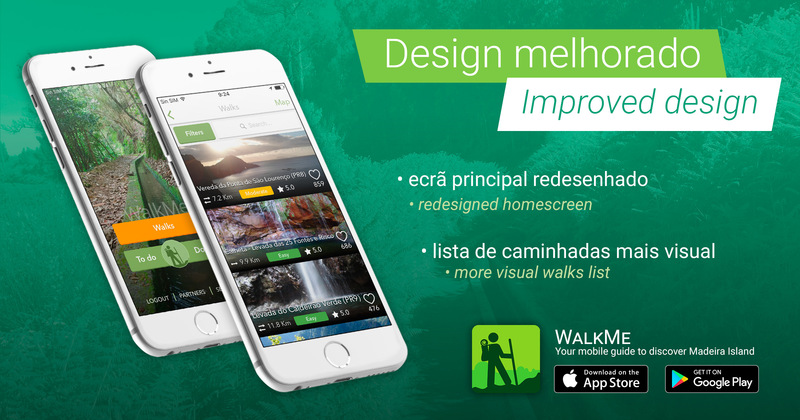 WalkMe is an iOS and Android mobile application that aims to be a guide to all hikers in Madeira Island and Porto Santo, providing useful information about the levada walks such as photos, description, map, ways to get to the levada and much more. You can use this application either for planning or during the levada walk. Also, if you don’t have an Android or iPhone you can always visit our website (www.walkmeguide.com) which has all the information of the trails just as it appears on the mobile application. Why creating this mobile application? At some point we felt the need to have a place where all related information about the levada walks is centralized. But above all, we needed something that can be with us in our adventures and at the same time, allow us to share experiences with other hikers. And they with us! We want WalkMe to be something innovative that encourages and guides more and more people in discovering Madeira Island natural wonders. Who are the persons behind WalkMe and what do they do? We are a team of three Software Engineers at the University of Madeira and we LOVE hiking, especially on Madeira Island, Portugal. We combine our strengths to enhance our skills and create useful, different and engaging solutions. Currently we are developing mobile applications for Android and iOS. We are working in a room named Steve Jobs at Madeira Tecnopolo which was the result of a partnership between the CEIM (Business and Innovation Centre of Madeira) and the University of Madeira. What are the key features of this application? GPS trail on Google maps or OpenStreetMap, You decide! All trails are saved on the phone. So no data connection is needed (except to see the pictures). Can we expect more from WalkMe in the near future? Of course! Since the beginning of this project we have never stopped! We added new features along the time in order to improve the service provided and we will continue to do so. Also there are new trails added regularly to give more options to our users and allow them to meet and know new places of Madeira Island. Which trails/walks are available and in what languages? We currently have more than 30 trail’s including the famous Rabaçal – 25 Fontes, Queimadas – Caldeirão Verde, Monte – Levada dos Tornos, Pico do Areeiro – Pico Ruivo, Ribeiro Frio – Portela, Caniçal – Ponta de São Lourenço, Calheta, Levada do Rei, Levada dos Maroços and more. All the information is available in English, Portuguese and Spanish and we’re working to make it available in German and French.